If you are new to in-home facial steaming or looking to it for a solution for your acne problems or a good skin routine, then questions like “How long should I steam my face?”, “How often should I do it?” and the like are perfectly reasonable questions to ask. Because certainly, the last thing we want is to aggravate a pre-existing skin problem or ruin a perfectly good skin. Because steaming causes the pores to open, oil and dirt build-ups and makeup residues are eased out of your skin. This also makes it easy to remove whiteheads and blackheads later after your steaming session. The warm mist from the hot water will get the blood pumping in your face the way exercise gets your body worked up and sweating like a pig. And as you well know, sweat helps get rid of toxins in the body. Also, with the surge of blood flow, minerals and nutrients reach your facial skin cells. Facials help prevent pimples, whiteheads, and blackheads. With the pores opened and the natural oils flowing freely, your skin becomes a less ideal environment for irritation or infection. Normally, our skin regenerates around every 27 days. However, as we age, our skin, much like our other organs, begins to become less efficient. Facial steam helps in sloughing off dead skin cells. With unblocked pores, you allow optimal absorption of the ingredients in your face pack, cream, or serum. Besides skin health, a facial steaming session takes care of your respiratory health. The moisturizing mist is good for your inflamed sinuses, decongesting your blocked airways. Some people mix a few drops of essential oil in the water to further improving breathing. Other than for aesthetic and health reasons, a facial steaming session makes for a good wellness routine. It helps you relax and recharge after a particularly tiring day. 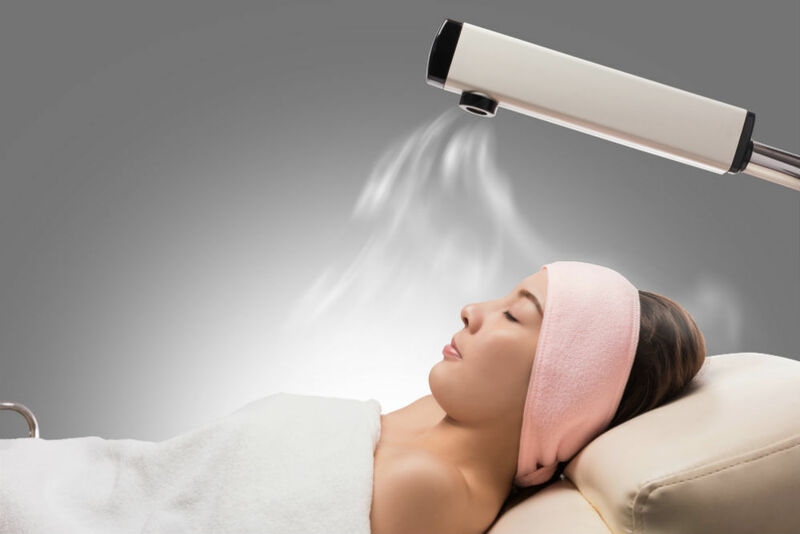 If steaming your face can derive many benefits, then is it possible to have too much of a good thing with it? This question is a valid concern. And while no particular answer can fit all skin needs, not going over 15 minutes per steaming session should keep it safe for you. If you have sensitive skin, then five minutes should be enough; it’s even possible that the treatment might not be for you. how often should i have a facial steaming session? Again, different strokes for different folks. But if you insist on a number, then limit your facial steaming sessions to at most two times a week. Too many steaming sessions may cause the opposite effect that you are going for. It may cause premature aging by destroying collagen strands. In other words, it may cause your skin to dry out and sag. what is considered a good distance? Safe facial steaming is not much about how long you put your face above the steam since it is about the right temperature or distance. Most professionals use only around 43°C or 110°F. Basically, the steam is less concentrated and cooler the further you are from the bowl of hot water. Observing a good 12- to 18-inch distance will be enough to heat up your face without burning it or damaging the capillaries under your skin. It would also be good if you slowly get closer to the steam instead of exposing your face to a temperature shock. what tools do i need for dIY facial steaming session? As with most DIYs, this method is pretty affordable, but it can be messy and time-consuming. All you need is a bowl of boiling-hot water and a towel. You place your head over the steam and use the towel as a tent to keep the steam in. A more convenient way to have a facial steam session is by using an electric facial steamer, which you can buy in local shops or online stores. You pour water in its tank, and it will be spraying warm mist in less than a minute or two. Some models come with a facial cone eliminating the need to use a towel for tenting. Additionally, others also have a nasal or mouth attachment, which can come in handy during allergy or cold season. Step 1: Wash your face to remove the superficial layer of makeup, dirt, and sweat. This is important as you would not want any impurities to get in the way. Step 2: Exfoliate with a gentle scrub, targeting the T-zone area—forehead and nose—or the oilier parts of your face. Use gentle small circular motions. Step 3: With your choice of tools, allow steam to envelop your face. You can use a towel to trap the warm mist in. Putting a few drops of applicable essential oils will also improve your overall experience. Stay under the mist anywhere from five to 15 minutes. Step 4: Apply your choice of facial mask. Applying it after a facial steaming session allows you to make the most of your facial mask since the skin can then better absorb it. If you’re using an anti-acne mask, then the time is also perfect to wedge out loosened blackheads and other blemishes. If you’re not using a facial mask, then an astringent or toner makes a good replacement. Step 5: Lastly, don’t forget to moisturize your face to rehydrate your skin. If you still find yourself asking “How long should I steam my face?”, “How often should I do it?” Or “What’s the best way to go about it?” then there’s only one way to know, and that is to try and find out for yourself what works best for you. Just remember the limitations and rationale behind each step and be sensitive to your needs.